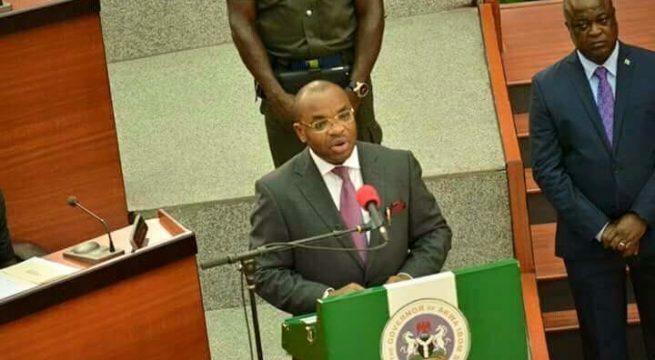 Governor Udom Emmanuel of Akwa Ibom State, one of the big oil states in Southern Nigeria, has unveiled a N671 billion war chest for the 2019 polls tagged: Budget of Industralisation for Poverty Alleviation. While presenting the 2019 Budget to the state House of Assembly on Wednesday, the governor who is battling for a re-election on the platform of the Peoples Democratic Party (PDP) said the budget proposal was prepared in accordance with International Public Sector Accounting Standard (IPSAS) – Accrual Template. ‘’It is a comprehensive IPSAS package that classifies transactions into Revenue, Expenditure, Asset and Liabilities. Thus, it aids effective and efficient financial analysis. We have christened the 2019 budget as the Budget of Industrialisation for Poverty Alleviation’’, Governor Udom, a former bank top executive said. Their 2018 budget was tagged Budget of Consolidation on industrialisation. It was so named because the state under his watch had started witnessing a breakthrough in industrialisation through the construction and commissioning of some industries that are currently in full operations. They also attracted more Foreign Direct Investments, which boosted the fortunes of the electorate and improved employment opportunities. But in 2019, the Udom administration will be having an herculean task to retain power with Senator Godswill Akpabio, a former governor, already galvanizing the All Progressives Congress (APC) to wrestle power from the PDP in Akwa Ibom. Though it is being alleged that Akpabio may have defected to APC in a bid to keep the books of graft under wrap, he however, has an enormous financial muscle, though questionable, to rattle Udom and the PDP in a state he dominated for eight years from 2007-2015. That aside, the government intends to build more industries and attract more Foreign Direct Investments, while ensuring the consolidation and sustenance in our already actualized and on-going socio-economic programmes in health, education, roads, electricity, water supply, agriculture, information technology, capacity building, infrastructure, housing, commerce and industry, aviation, general administration, political posterity and security, Legislature and Judiciary. ‘’A lot had been put in place in term of infrastructures already, but we need to do more. Our belief and conviction is that through industrialisation, the fortunes of people would be greatly improved and employment opportunities will abound for our people thus, lifting the standard of living’’, the governor said, pointing out that the policy thrust of the 2019 budget is aimed at reducing dependence on statutory allocation as the main source of revenue to the state. This, according to him, will be pursued by establishing more industries, improving IGR and providing the enabling environment which will encourage private investments in the State. The State Government will also create employment opportunities and improve the living standard of our people by providing basic infrastructures, enhancing security, develop human capital and continue to boost services in education and healthcare. The rest of Governor Udom’s budget proposal goes thus: ‘’About three years and five months ago, destiny and a passion to serve flavoured with an acute sense of duty and abiding faith in our common essence brought us together to write a new chapter in the inspirational story of this blessed Land of Promise. ‘’Conditioned by our shared commitment to the Akwa Ibom Project, shaped and distilled by our Founding Fathers avowed pursuit of unity, love, peace, security, and an unbridled faith in God, we have today, produced an Akwa Ibom success story that has resonated with our people here and in the Diaspora and ignited in the process, a sense of renewal that even our naysayers can’t help but applaud. ‘’Permit me to pay special tribute to your patriotism and the strong partnership which we have forged over the course of the past three and half years as we work to better the lot of Akwa Ibomites. Our shared vision of a more prosperous, peaceful, strong and secure society has challenged us to build a State where our people would and should have a decent standard of living, pursue their legitimate aspirations under peaceful and safe circumstances, while creating economic opportunities. These core aspirations have energized our passion, fired our sense of purpose and the unbridled resolve to leave the State better than we met it. In this fourth episode of our budgetary submission, we look forward to a faster and more prosperous Akwa Ibom State where no one is left behind on the train of progress and development. ‘’Honourable Members let me again express my deep and profound appreciation for your unflinching support. This has translated into the tremendous democratic dividends that we have witnessed in our State through the many life-touching programmes and projects we have executed. ‘’To the good people of Akwa Ibom State, we thank you for your unalloyed cooperation, prayers and support. Together, we weathered the storms of recession and kept sailing when some states were struggling and needed to be provided lifelines. When men had said there is casting down, our testimony had always been that there is a lifting up. God bless you all! ‘’Above all, we appreciate the Almighty God who had bestowed His benevolence upon us as a State. He has given us representatives and leaders with knowledge, understanding and wisdom in handling the affairs of the people. To Him be the glory and ONLY GOD Himself could have made this possible. ‘’Mr. Speaker, as the proponent of the Dakkadda philosophy, permit me to say here without the slightest tinge of immodesty that I have big dreams for this State; dreams which we have so far translated into concrete manifestations in our determination to make Akwa Ibom State rise to greater heights of glory. The Good Book says you will walk and not be weary, you will run and not be tired, you will mount up on wings and fly. This State has walked; it has soared and its wings are steady because the Leader behind the controls is one laden with integrity, character and love for the people. It is the dream of an economically thriving society where peace, security and love form the building blocks that colours my thoughts each time I appear in this Hallowed Chamber to address you. I recognize that you are my dear and cherished partners and co-drivers in the train of development and progress of our dear State. ‘’Mr Speaker, let these sentiments of love and togetherness provide the moral context for this Constitutional obligation which I am about to discharge. I, therefore, crave your kind indulgence to share with this Hallowed Chamber, the vision, policies, programmes and projects of my Administration and to present for your kind consideration and approval, the Estimates of Revenue and Expenditure of Akwa Ibom State Government for the 2019 Fiscal Year in accordance with the provision of section 121(1) of the 1999 constitution of the Federal Republic of Nigeria. ‘’Mr. Speaker and our dear Honourable House Members, please bear in mind the cardinal objectives of my Administration, as encapsulated in the Five-Point Agenda. These are: Job Creation, Poverty Alleviation, Wealth Creation, Economic and Political Inclusion, and Infrastructural Consolidation and Expansion to further transform the state into an industrialized entity. These are the Five Pillars of my governing philosophy. ‘’Operating within the framework of the approved budget and the limits of available resources, we have been able to record remarkable achievements in our industrialization efforts. We have consolidated on the gains of democratic governance and we have given fresh breath to our campaign promises. ‘’Let me state again as I said during our Third Anniversary that there is no first term Governor who has done as much as what we have done here in this State. In spite of the harsh economic realities that stared us in the face when we came in; in spite of the sharp drop in the price of oil and the attendant hyper-inflation; in spite of the turbulent cloud on the economic horizon, we have remained steady, focused and passionate in our tireless and passionate devotion to delivering solid democratic dividends for our people. ‘’We came prepared to win, to secure our future based on the strength and promise of yesterday and the goodness of heart and ingenuity of our people. 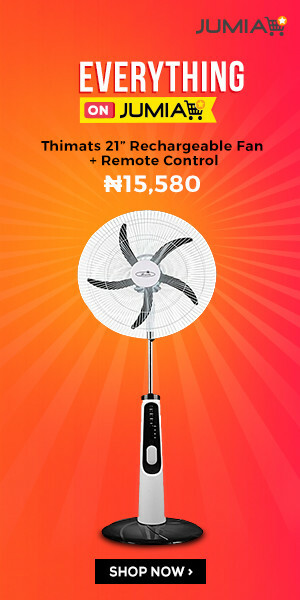 Together, we have done this in a spectacular fashion, wining accolades and commendations even from leaders and institutions of the Federal Government, such as the Nigerian Television Authority (NTA) which early this year, gave me the Integrity and National Service Award. ‘’Where others saw despair, we saw hope, where others saw challenges, we saw opportunities. Where others were bent by the enormity of problems they faced, we stood ramrod straight, shoulders held high, providing solutions to ease the pains of our people. Elsewhere, while, workers were owed salaries and pensions here, our workers smile to the bank at the end of every month. ‘’Elsewhere, the commissioning of a few kilometers of road is done with pomp and pageantry but in our state, we have constructed, commissioned or work is on-going on over 1700 kilometers of good, enduring and commercially viable roads, opening up the hinterland and we do this, without unnecessary fanfare because we are on a cause for sustainable development not a fleeting or ephemeral feeling of applause. Upgrading of Akwa Ibom State College of Arts • & Science, Nung Ukim, Ikono to College of Science and Technology. ‘’The preferred bidder is Bollore-Power China Consortium which is Africa’s leading port operator with 18 container terminal concessions in Europe, Africa, India, Asia and the Americas. China Harbour Engineering Company Ltd has been selected as the Reserve bidder. We are in the process of commencing negotiations with the preferred bidder to work out the investment and concession details, preparatory to the actual commencement of construction work on the project. We are leaving no stone unturned in the realization of this dream and I can boldly say that with God on our side, the Ibom Deep Sea Port will be operational within the lifespan of our second term in office. Cultivation of about 2,100 hectares of cassava in partnership with • World Bank under FADAMA III Additional Financing Project, using farmers co-operatives. Construction of 1No. Tractor Hiring Enterprise (AEHE) Centre with 4 • No. tractors, and 14No. implements delivered. So far 75hectares of farmland has been ploughed, harrowed and ridged through the Centre. Planting of 500 citrus seedlings, 600 hybrids plantain suckers and • 1,000 pineapple suckers at the Horticulture Garden, Wellington Bassey Way in Uyo LGA. Construction • & upgrading of secondary healthcare facilities across the State. Provision of residential quarters for 48 House Officers in the State Hospitals and 50 in the University of Uyo Teaching Hospital (UUTH). 5. Implementation of the Child Rights Law. – Prosecution of Child’s Rights offenders in collaboration with the Akwa Ibom State Judiciary and Ministry of Justice, Security services, Police etc. the cases include: Child Abuse, Child Neglect, Child Abandonment and Trafficking, Maternal/Paternity issues, Raped, Baby Factory Operation and Disinheritance. Over 200 cases have been recorded since 29th May 2015. About one hundred and twenty (120) have received judgment. Some of the offenders are serving their jail term. 1. Expand the revenue base of the State by eliminating wastages and leakages in expenditure, and improving IGR collection and development of tourism potentials. ‘’Analysis of sectoral allocation above shows that priority is given to projects and programmes under the Economic sector. ‘’Government will also provide instructional materials, textbooks, laboratory equipment/fittings, chemicals and reagents to ensure that the student receives quality education for improved performance in research and internal and external examinations. Government will continue to pay Bursary and award scholarships to deserving and exceptional students of Akwa Ibom State origin in Tertiary institutions across the country, as well as pursue full accreditation of academic programmes in the state-owned Tertiary Institutions through the provision of adequate funding and recruitment of qualified personnel to ensure that graduates from these institutions are recognized and can compete globally in their fields. To actualize these and other aspiration in the education sector, the 2019 budget sets aside the sum of N15.050 billion. ‘’The world today is going green through the adoption, development and use of renewable energy and efficient utilization of nature’s energy resources. Since renewable energy can be used in electricity generation and production of cleaner vehicle fuel. There is a paradigm shift from an energy system powered by increasingly expensive, dirty and unsustainable fossil fuel resources towards the one powered by abundant, clean, local and affordable renewable energy sources. The State is not left behind in the global renewable energy and energy efficiency trend, as a Directorate of Renewable Energy and Energy Efficiency has been created in the Ministry of Science and Technology to specifically develop, install and maintain Renewable Energy Technology in the State. Government also intends to pursue e-governance, establish Resources and Development Laboratory, Technology Workshop. etc. 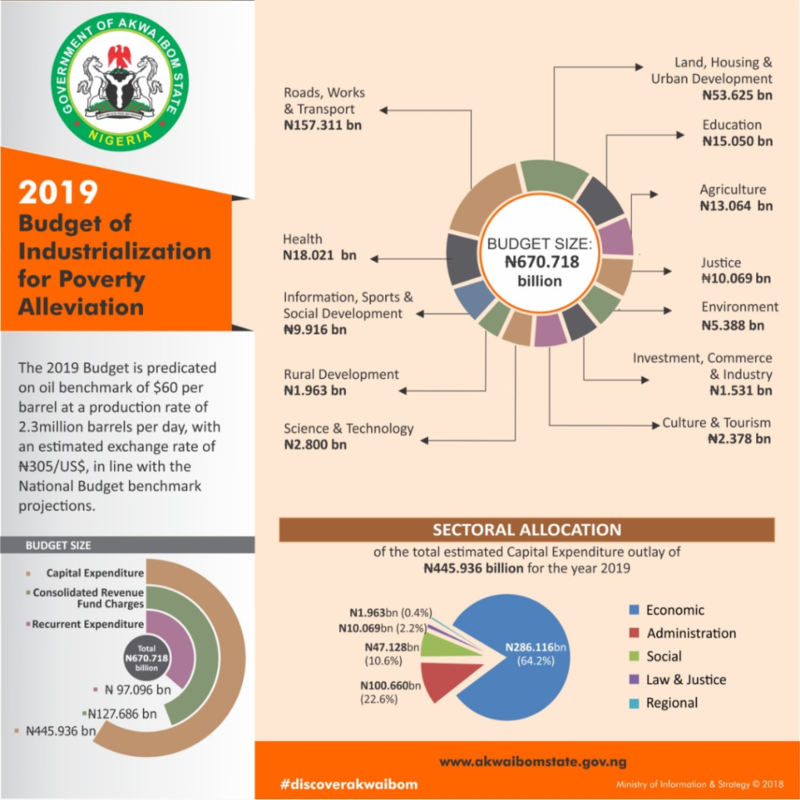 The 2019 budget proposes the sum of N2.800 billion, to execute these activities. ‘’This will be done through the provision of technical assistance, supply of agricultural inputs and encouragement of public/private sector collaboration to achieve government’s set objectives. ‘’The Industrialization drive of this Administration has yielded fruits in the number of jobs and amount of wealth created, Government will provide funding for the following activities to consolidate on the gains achieved so far: design and development of Industrial Estates/Parks including the upgrading of facilities in Uyo phase 2 industrial park; organization of export awareness campaign/export forum in a bid to promote non-oil export to de-emphasize dependence on oil for foreign exchange: industrial promotion programmes in collaboration with relevant agencies and private investors to identify and establish at least 3 new industries by December, 2019: organization of business education and development programmes to encourage entrepreneurial development in the state; participation in both state, National and international trade fairs; promotion of MSME’s development programmes: encouragement of industrial research and inspectorate service to facilitate the development of enabling laws and legislation of industries. The issue of Security in today’s world is of paramount importance to all citizens of the world and to investors everywhere. This is made even more sensitive with the rising wave of terrorism and cyber-crimes. However, Akwa Ibom State has enjoyed an enviable position of peace and security and this must be maintained at all costs so that the State can remain a destination of choice for potential investors to come in and invest. This will lead to employment generation, poverty reduction and wealth creation for the people. These are the major desires of this Administration. Government has achieved much in this area and will continue to do more. We will continue to tackle any act of insecurity in the State by supporting and working closely with the security agencies to maintain the peace and security of our people. ‘’The achievements so far recorded despite our lean resources could not have been possible without the help of the Almighty God. It is by His grace that we have attained this level of excellent performance. We celebrate God’s grace and kindness to us as individuals and as a State, because it is ONLY GOD’s grace that this Budget of ‘INDUSTRIALIZATION FOR POVERTY ALLEVIATION’ will be judiciously implemented to achieve the philosophy of making Akwa Ibom greater and taking it to more enviable heights. ‘’I, therefore, crave your kind approval of these Estimates and your support for its implementation. We promise to faithfully implement the provisions of this Budget for the general good and well-being of our people. We will not relent in our resolve to alleviate poverty and restore hope, create wealth, generate employment, stimulate agricultural and industrial development and maximize the overall well-being of our people who have embraced the principle of ‘dakkada’ and will not look back. ‘’I implore you therefore to speedily consider and approve the 2019 Budget Proposals. The relevant details will be provided by the Hon. Commissioner for Finance.